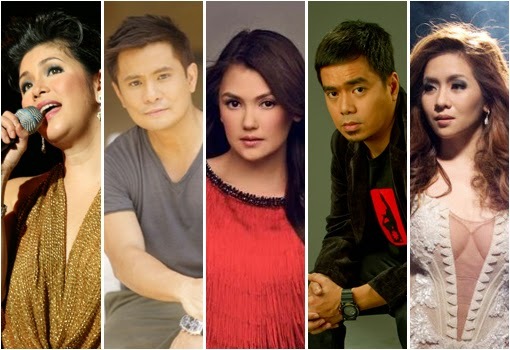 Before the weather gets hot, the Filipino community in the UAE are set to experience some of the hottest performing artists from the Philippines. 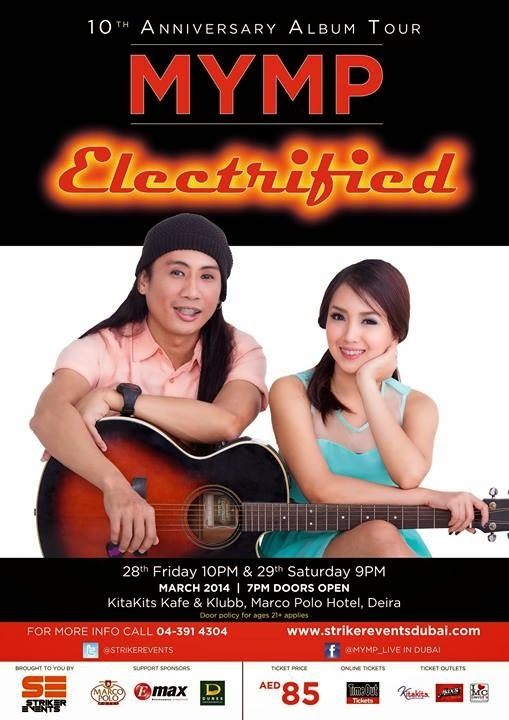 The original vocalists of Freestyle, Top Suzarra and Jinky Vidal reunites to perform the band's favorite hits like Before I Let You Go, So Slow and Bakit Ngayon Ka Lang. 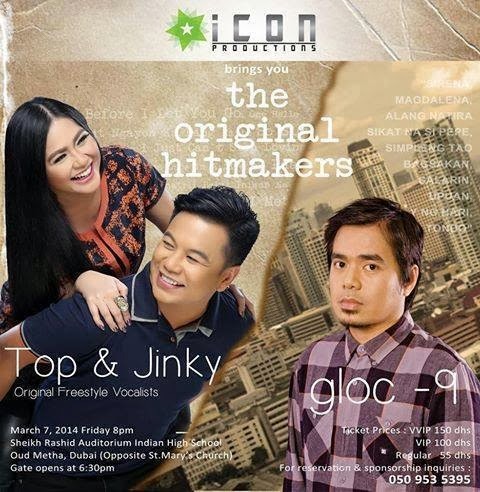 Joining them is one of the country's rap genius, an icon and most influential rapper, Gloc-9. 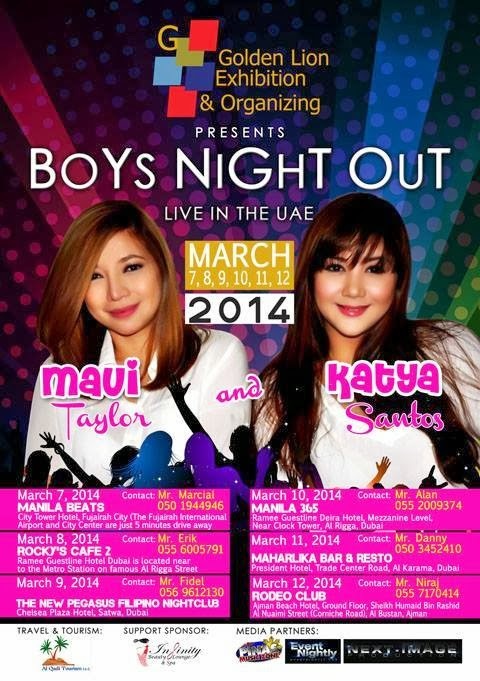 Viva Hot Babes Maui Taylor and Katya Santos will usher summer this early as they are set showcase their hottest performances that will surely thrill the boys. 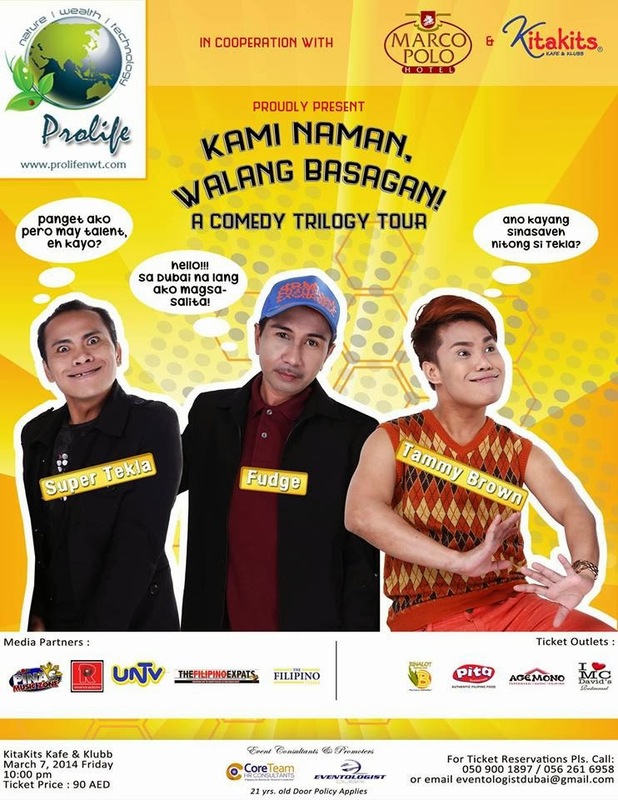 Laugh out loud, roll on the floor with this comedy trilogy from 3 of the most talented stand-up comedians from the Philippines - Super Tekla, Fudge and Tammy Brown. For tickets, call 0509001897 / 0562616958. See poster for other ticket outlets. The songwriter and the songbird, known as the power couple will heat up our hearts once again with their timeless songs and world-class performances. For tickets, call 0529900112. See poster for other ticket outlets. Chin and Jana, the new vocalist of the band, will celebrate 10 years of MYMP music. The group that has taken acoustic music to new heights will perform their greatest hits along with their new releases. 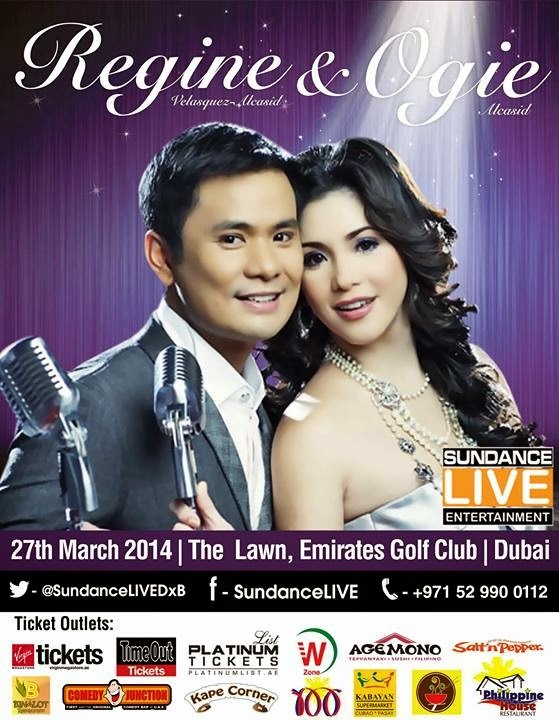 For tickets, call Striker Events at 043914304. See poster for other ticket outlets. A perfect thrill to start April! 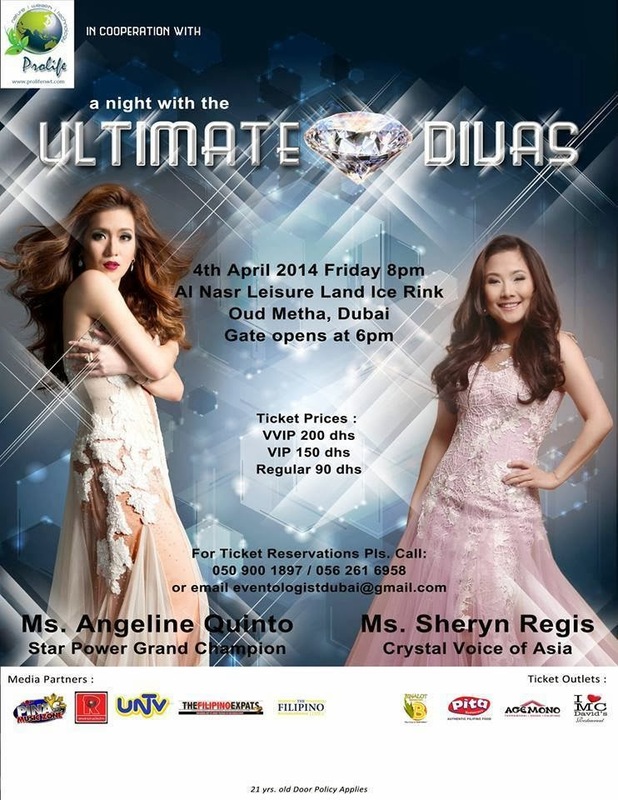 The crystal voice of Asia, Sheryn Regis and the queen of teleserye theme songs, Angeline Quinto are set to belt it out in Dubai. 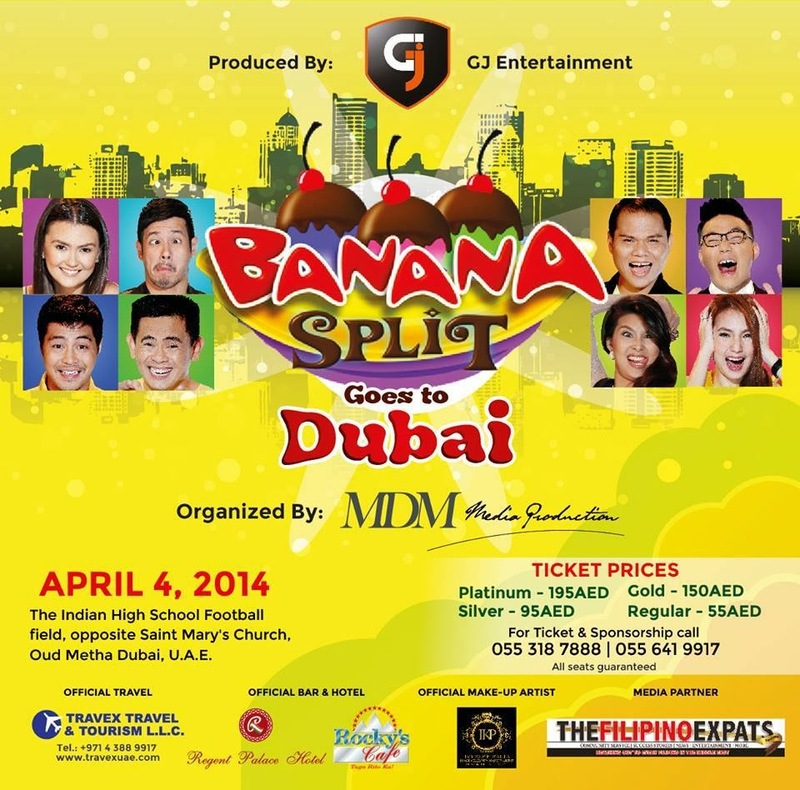 Angelica Panganiban, John Pratts, Zanjoe Marudo, Jayson Gainza, Pooh and the whole Banana Split gang are bringing their comic acts to Dubai. 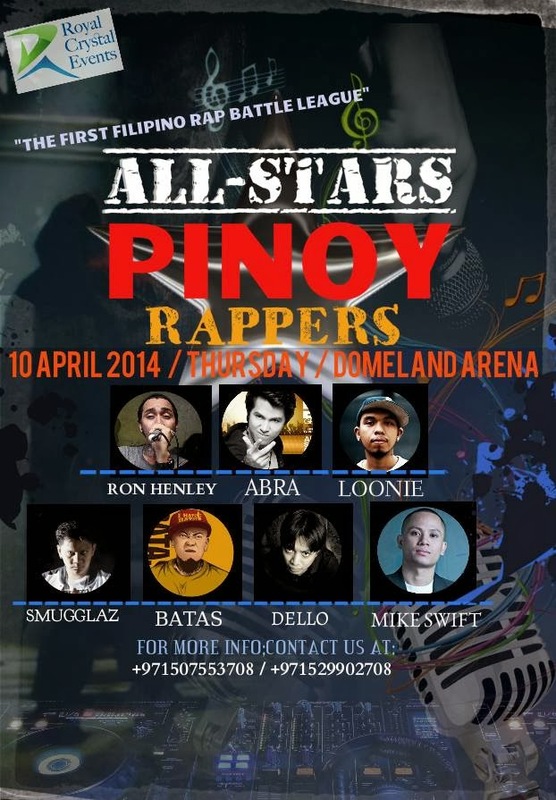 Abra, Ron Henley, Loonie headlines this event. 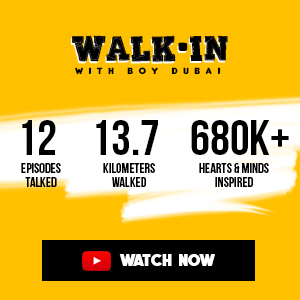 Get on and hop with the rappers and possibly some fliptop battles, as these new and upcoming big names in the Pinoy rap music genre invades Dubai. .